GARY S. NITSCHE is the managing partner of the law firm of Weik, Nitsche & Dougherty. He handles personal injury matters with an emphasis on motor vehicle accidents, work injuries, nursing home cases and premises liability cases. He has substantial litigation and trial experience and has tried approximately fifty (50) jury trials. He has received numerous multi-million dollar verdicts and settlements. 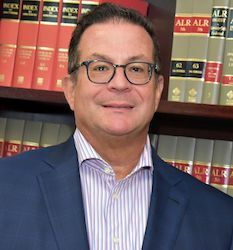 He has litigated some of the most significant and important personal injury cases and law changing decisions in the fields of personal injury uninsured motorist coverage and worker’s compensation. Gary has been regularly honored as a Super Lawyer seven (7) years running 2011 - 2017. He has also been recognized by the Best Lawyers in America for personal injury for the past seven (7) years running 2012 - 2018. He likely has the largest personal injury practice in the State of Delaware. He also co-authored Delaware’s pre-judgment interest law, an important law change for injured parties. I hired Gary Nitsche as my attorney and he was very helpful and determined to resolve my case. Stayed on top of everything, along with keeping me updated with changes. I thank him and his office and would/will recommend him to anyone in need of a attorney. I needed some advice regarding putting my grandson on my auto policy. I had a free phone conversation with Mr. Nitsche, and he answered my questions very professionally and to the point. He was a very nice man. I am now feeling so relieved and am happy about my decision. From the first phone call I made to the office up until now. Has been a great. Mr. Nitsche took my case with no hesitation. The firm helped me received everything I needed to get compensated for my accident and more. The staff was wonderful and I just want to say thank you. Very professional and caring. He goes that extra mile to help you. Gary made me feel more tag just a client, he made me feel like family. His paralegal, Myra was very prompt and professional. Soon as I called the office and couldn't get through my call was returned immediately. I would recommend Mr. Nitsche as the lawyer you would need and want. Gary & his staff were very sensitive with my mom (who is elderly) coming to her when needed, arranging meetings to be sure she was comfortable. Answered questions quickly & thoroughly. Made a very difficult situation for our family much easier to navigate - can't thank them enough!